The second annual Ole’s Ride was held August 27, 2011, and raised $4,620 to benefit Hospice of the Red River Valley. 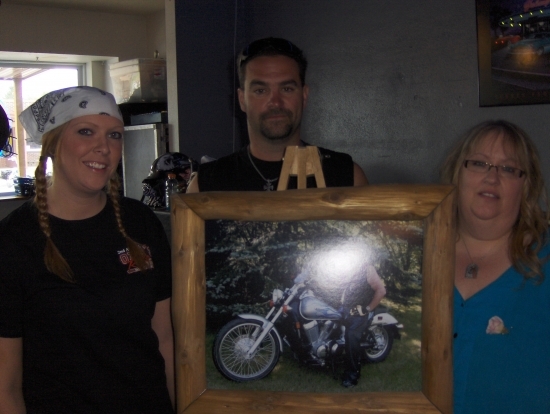 The event was in memory of Ole Barten, who lost his battle to cancer in February 2011. Hospice of the Red River Valley cared for Ole during his last months, and the family wanted to use the event as a way to give back to an organization that cares for so many families in the area. The ride kicked off from Billy’s Corner Bar in Vergas. More than 90 motorcycles participated in the 125-mile ride. Nearly 200 people took part in the various events throughout the day, either as riders, volunteers or other participants. Moments of special meaning took place throughout the day for Ole Barten’s friends and family. The route included a drive past his final resting place; riders revved their engines and honked their horns as they passed the cemetery. Kris Barten, Ole’s widow and one of the event organizers, recalls finding special meaning during one part of the ride. “Ole worked for the railroad for many years, so it was very meaningful when the entire group of riders was stopped behind a train at a railroad crossing during one point,” she said. Committee members were Kris Barten, Jessica Sonnenberg (Ole and Kris’ daughter), Justin Helmke, Tyson Sonnenberg, Kevin Flynn, Mud Bervin, Stacy Bervin, Wes Kellogg, Marty Carlson, Kayla Soland, Shawn Nelson, Amy Nelson and Marshall Rach. The ride also had 12 cars of road guards, led by Jeff and Wendy Zitzow, who were responsible for the safety of the bikers.